All summer, Montague has been a town in trouble. The city sits half an hour south of the Oregon border, in a rugged patch of Northern California that offers little refuge from the scorching sun. For water, the roughly 1,500 people who live here depend on snow melting from the slopes of Mount Shasta, about 20 miles to the south. But the snowpack this past winter was, by all accounts, pitiful. Standing on a hill near the edge of town at 8:30 in the morning, before the sun and the temperatures have had much time to climb, Chris Tyhurst looks toward the mountain and says, “I think I see two little spots of snow, about a square foot each.” Tyhurst, who has blue eyes and the calm demeanor of a recreational pilot, is joking, but in his nearly four decades as Montague’s water manager, he says this summer has been the toughest. The city has been forced to cut water use drastically. Tyhurst says folks are using roughly one-third the amount they normally would this time of year. Nearly every lawn in town has turned a crispy blond, except for those belonging to a handful of residents who have their own wells. The city has imposed a monthly limit of 5,000 gallons per home, with fines for running over that. More than a hundred households have gone over the limit this summer. It’s hard not to, a sympathetic official tells me, if you have three kids at home. The worst offenders got letters from the Montague City Council. The "nightmare scenario," as Tyhurst puts it, would be having to truck in water just to keep Montague’s water system pressurized, at an expense of hundreds of thousands of dollars. Tyhurst figures that would take a procession of some 30 trucks a day, each hauling 3,500 of gallons of water, rumbling from dawn to dusk every half-hour through the normally quiet neighborhood -- a place where deer are a routine sight. 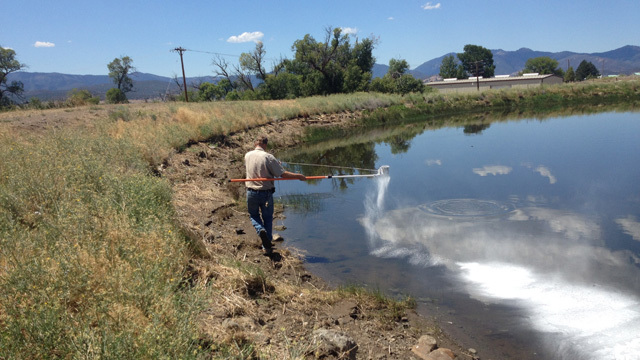 Any scheduling hiccup could lead to trucks jamming the narrow unpaved road that leads to the town’s reservoir, which resembles a farm pond, complete with fish and turtles. To keep from resorting to the water convoys, Tyhurst says he’s willing to try just about anything, including a measure that's rarely been tried in California. It’s a fine, white powder Tyhurst has taken to sprinkling over the three-acre reservoir every few days, using a flour sifter on the end of a long pole. The powder readily dissolves and spreads across the surface, forming what’s called a “monolayer” between the water and the air, aimed at slowing evaporation to buy the town's water supply a few extra days or weeks. 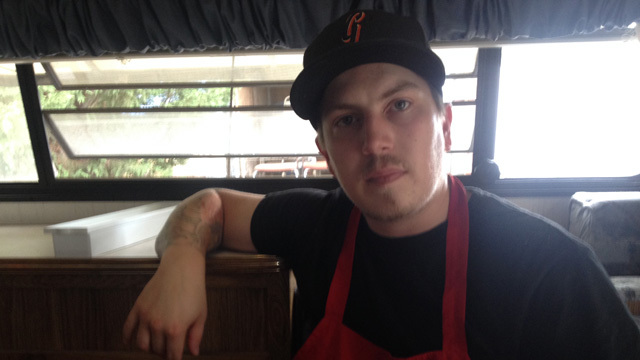 At the town butcher shop, 26-year old Douglas Hamblin says he hears talk from ranchers of having to cash out their chips if the weather doesn’t start cooperating, and soon. Hamblin has a tattoo of Jesus Christ on his arm, and big holes through his earlobes from the thick gauges he used to wear. Hamblin’s family only moved to Montague and started running the shop a couple years ago. While it’s equipped with a washing machine for aprons and rags, Hamblin says they haven’t been using it, because of the town’s limit on water use. Instead, his mother drives miles to another town each week to do laundry. Near the base of Mount Shasta sits Lake Shastina, which in good years can hold more than 30,000 acre-feet of water. (An acre foot is about 325,000 gallons, or just enough water to cover an acre one foot deep.) This year, Tyhurst says, the lake started well below 10,000 acre feet, with little in the way of snow on the mountain to help refill it. By late July, parts of the lake seemed to be missing -- a blue patch on a map might just turn out to be an empty green field. 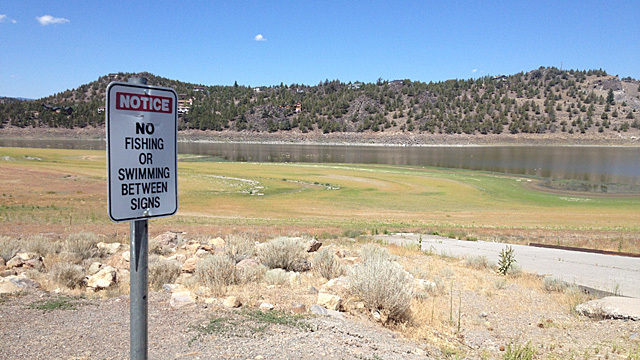 In one spot, a sign next to a dry, rocky slope advised against swimming or fishing. The lake, or what remained of it, looked to be something of a hike down the hill. Water travels to Montague in what Tyhurst calls “deliveries.” Every few weeks, some 200 acre-feet are released into a 26-mile canal that was constructed with farm irrigation in mind. The unlined ditch is poorly suited to water conservation. Much of it is bare earth, which gulps down a lot of the water long before it reaches the town, to say nothing of what evaporates in transit. 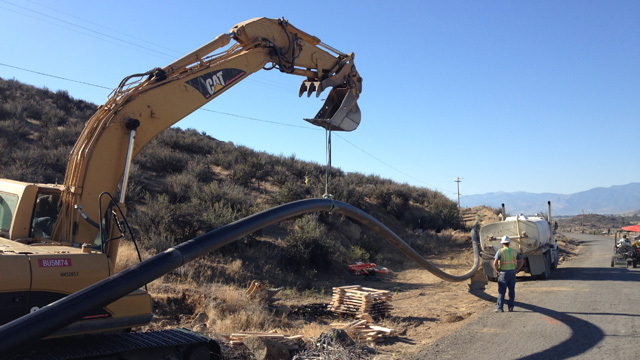 As an alternative, this summer Montague has hustled to finish an emergency pipeline, essentially a straw that stretches a few miles from the Shasta River to the town’s reservoir. Tyhurst says normally such a project, which is costing over a million drought emergency dollars from the State Water Board, would’ve taken years to win approval from the numerous government agencies involved. Tyhurst credits the governor’s January declaration of a drought emergency with helping slice through all that. Even when the pipeline is ready, Montague officials told me, the town’s water woes won’t be completely over. Everyone's hopes are riding on a wet winter.